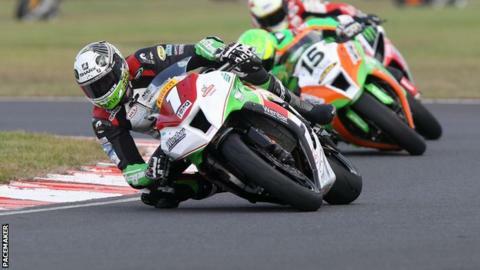 Recently crowned British Superstock 1000cc champion Danny Buchan won the feature Sunflower Trophy race at Bishopscourt on his Tsingtao Kawasaki. Buchan won from Gearlink Kawasaki rider Ben Wilson, with Andy Reid from Jordanstown third on his first Superbike ride on the Milwaukee Yamaha. James Egan, Alastair Seeley and Jamie Hamilton made up the top six. Glenn Irwin, who set a new lap record in winning the Supersport race, crashed unhurt while leading the Sunflower. Essex rider Danny Buchan wins the Sunflower Trophy for the first time while Glenn Irwin scoops four victories at the big short circuit meeting at Bishopscourt. The Carrickfergus rider came off on the opening circuit of the 12-lap race. Buchan won the first Superbike outing of the day from Wilson, with 2013 Irish Superbike champion Nico Mawhinney completing the podium. Irwin was followed home in the first Supersport event by fellow Carrickfergus man Seeley, with Wilson third. The County Antrim man was also victorious in Supersport race two, with Wilson runner-up and Seeley third on the Mar-Train Yamaha. Irwin made it a four-timer on the day by crossing the line first in the two Supertwins races. Reid fell off unhurt in Superbike race one while Christian Elkin took the chequered flag in the opening 125cc/Moto 3 outing.